CH says: During the summer of 1994, I spent a little over a month in Vienna, doing an intensive German language course. The school was located in the heart of the oldest and most beautiful part of the city, just steps from St Stephansplatz. In addition to being located perfectly for lunch hour and after school sightseeing sessions, this meant that most of Vienna’s best and most famous coffeehouses were just a few minutes away. My 5 classmates and I took 6 hours of classes a day from a couple of really grumpy old Austrians, so you can bet we really needed to unwind in between and after classes. Our lunch hour was literally one hour. Which meant that we couldn’t spend too much time exploring. Most days, we grabbed a bratwurst and a beer and ate sitting on the steps of some grand historic building, enjoying both the cityscape and the fantastic weather. After school, however, (and on weekends) we spent as much time as possible checking out the coffeehouses, pastry shops, wine taverns and bars that make Vienna famous. It was during this summer stint that I took my first bite of Sachertorte. Sure, I had heard of it. But for some reason, I’d never actually eaten one. I had the pleasure to try both the versions at the Hotel Sacher and at Demel’s, possibly Vienna’s most renowned café. Both were amazing. And over that summer, I became totally hooked (I should also admit that I don’t usually enjoy chocolate desserts, but I loved these). It got to the point where I’d save money on other things just so I could sneak off by myself to the Hotel Sacher (whose version I like just a bit better) and indulge in a slice and a mélange. Let me say that I’m so very glad I had never eaten a Sachertorte before then. I have friends (like my wife) who, when I tell them I’m a Sachertorte addict, shake their heads, unable to understand and appreciate my enormous fondness for this historic, apricot-enhanced chocolate cake. The reason, I have come to believe, is because of the vast numbers of substandard Sachertortes that proliferate pastry shops around the world. 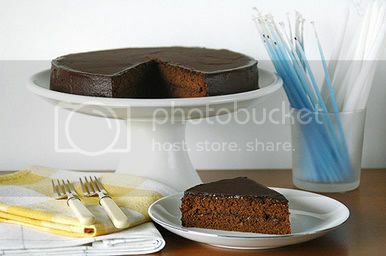 For those who may not be so familiar with this cake, a Sachertorte consists of chocolate sponge cake cut into layers, between which and over which apricot jam is spread. The whole cake is then iced with a chocolate ganache and served with a side dish of whipped cream. The cake was created in 1832 by a 16 year old chef named was Franz Sacher. Early that year, Prince Clemens Lothar Wensel Metternich (1773-1859) of Austria, famous for his love of new flavours and foods, ordered his kitchens to create a new cake. When the orders made their way down, the kitchen went a tad nuts. The head chef was sick and the rest of the cooks didn’t know what they should make. Sixteen-year old Sacher, an apprentice cook, took charge and created this famous chocolate cake with the ingredients that were available. The Sachertorte (and other recipes) eventually made him rich, and he was able to open several cafes and restaurants over time. In 1876, his son, Eduard Sacher, opened the Hotel Sacher, known to every traveler as one of Vienna’s best hotels. On a curious and inexplicable note, Franz Sacher sold his original recipe to Demel’s, while the Hotel Sacher made and still makes its own version, calling it the “Original Sachertorte,” while Demel’s has to call its “Demel Sachertorte.” Of course, many other coffeehouses make their own versions. A couple of years ago, I ran across a book by Rick Rodgers called Kaffeehaus: Exquisite Desserts from the Classic Cafés of Vienna, Budapest and Prague. Of course, I had to buy it. Not only am I a fan of Sachertorte, I’m also enamored with Kipferln, Strudel (especially milchrahmstrudel), Buchteln, Topfenpalatschinken, and a number of other Central European yummies. But more than anything, I wanted this book in order to learn to make Sachertorte. Unfortunately, Sachertorte quickly became to me what the River Café’s Chocolate Nemesis is to so many others… you know, that damn yummy cake you just can’t make properly, no matter how many times you try. Each time I tried making it, something would go wrong. Either my jam was too lumpy or the sponge cake had too many holes or came out too dry. Eventually, I gave up and began begging my wife S, a much more talented baker than I am, to try making it. After a year of groveling, she’s finally tried. And, on only her second attempt, pulled off a winner! S says: Having never been to Vienna (as yet), I’m a Sachertorte non-convert. Friends have cracked open their beautiful packages from the famed Hotel Sacher (and Demel’s, I do vaguely recall) and generously shared their stash of black gold with me. I’ve sniffed, nibbled and tasted, but each experience has left me wondering if there was something wrong with my tastebuds. What am I missing out on? I don’t get it. But CH can get very persistent when his tummy gets fixated with any manner of gustatory pleasure. (Don’t get me wrong, I say this with great affection.) With little more than a desire to please my husband to inspire me, I’ve read pretty much every Sachertorte recipe I could get my hands on. (As CH read this over my shoulder, he muttered something about how good I am at making myself sound like such a martyr.) Eventually, I settled on a trio of recipes, two of which are not Sachertorte recipes per se. For the chocolate sponge itself, I chose Rose Levy Beranbaum’s Moist Chocolate Genoise from her award-winning Cake Bible. Light, yet velvety and moist, it is the perfect canvas for our elegant chocolate extravaganza. I like that she uses chocolate cooked with water in place of the more commonly employed cocoa powder. Just a half portion of her recipe is needed for a 9-inch cake (plus our little KitchenAid nearly overflowed when I first attempted her full recipe and because of that, I couldn’t fold the chocolate in properly, resulting in a less-than-pleasing torte). This is the halved recipe. I’ve paraphrased the instructions heavily. Grease 9-inch round cake pan or springform pan, line bottom with parchment, grease again and flour. Preheat oven to 180 degrees Celsius. In a saucepan, bring chocolate and water to a boil over low heat, stirring constantly, Simmer, stirring until chocolate thickens to a pudding-like consistency. Cool completely. Beat eggs and sugar with whisk beater on high speed until triple in volume. Sift half the flour over the egg mixture and fold it in. Repeat with the remaining flour until all the flour has disappeared. Fold in the chocolate mixture until incorporated. Pour into the prepared pan (Baking Illustrated advises that you NOT pour it in from a great height, keep the lip of your mixing bowl as close to the base of your cake pan as possible to retain the fine bubbles needed to give your genoise its airy lift) and bake for 30 to 35 minutes, until a tester inserted in the centre enters as easily as it does when inserted closer to the sides. The cake will pull slightly away from the sides when it’s done. Unmold immediately to cool. Trim cake only when ready to assemble. For the all-important apricot jam element (and general assembly procedure) I dipped into Baking Illustrated. While the amount of apricot jam they asked for was far too generous (I eventually settled on a 10oz jar), blending it until smooth in a food processor then heating it on the stove resulted in the perfect pouring consistency. (After having tasted J’s jam, however, I’m inspired to try making apricot jam myself.) Slipping the cake into the refrigerator for 30min after the apricot jam has been slathered in-between and all over the assembled discs of cake also makes applying the final glaze of chocolate ganache a breeze. When it came to the chocolate ganache glaze, I finally picked Sherry Yard’s recipe from The Secrets of Baking. Again, half the recipe is more than enough. I like the touch of apricot jelly she calls for which subtly echoes the haunting apricot top notes in the cake. Light corn syrup gives it a gorgeous, velvety sheen. This is for a half portion of Sherry Yard’s ganache glaze, enough for the torte I made. Warm the apricot jelly over low heat, stirring until it is melted. Whisk in the cream, milk and corn syrup. Increase the heat to medium and bring the mixture to a boil. Pour the hot cream mixture over the chopped chocolate. Using a rubber spatula, slowly stir in a circular motion, being careful not to add too much air to the ganache. Stir until chocolate is melted. Glazing should be done once the ganache reaches 90 degrees Fahrenheit. To assemble, trim your cake and slice it to form two thinner discs. Spread apricot jam on one disc, then place the other layer over it. Cover the top and sides of the assembled cake with remaining apricot jam. Refrigerate for 30 minutes, then glaze with chocolate ganache. For both genoise and ganache, I used Valrhona (66 per cent cacao). The next thing I’ll have to master is writing the word Sacher, in chocolate, across the cake. Perhaps I’ll leave that project to another rainy afternoon in. We’ve discovered that the Sachertorte actually tastes better a day after it’s been made. The chocolate flavours become more pronounced (important for a chocolate lover like me) and the apricot jam tastes less petulantly sugary. Freshly whipped cream is the other essential element. Each slice of cake demands a huge dollop of it. The clean simplicity of its flavour simultaneously heightens and yet softens the rich, dark complexity of the torte. I won’t say that this has become the most favoured chocolate cake recipe in my repertoire, but it certainly is one that I will keep returning to because for minimal effort, you end up with a timelessly elegant dessert. Like a beautiful string of South Sea pearls, it projects itself as being effortlessly stylish no matter what the occasion. And that makes it a winner in my book. P.S. : The above recipes are not word-for-word reproductions of the ones in the books I’ve mentioned. I highly recommend taking a look at the originals. All three titles are ones I consult regularly. wow! this looks deliciously good & the igredients are simple. Never good at baking, but really tempted to give it another try. may i know if you are using electric or convection oven? always have problem with convection ones as the top seems to get burnt faster. thanks! That was a very informative post – thanks! I’ve tried couple of Sacher recipes, and the cakes have been lovely. However, as I haven’t tried _the_ original, I cannot say whether or not they were authentic at all, and I can’t say that Sacher is my favourite chocolate cake. Maybe I’ll eat my words when I try the original – or maybe I should try S’s version..
By the way I also have that book by Rick Rodgers, though I have yet to try a recipe from it. I’m almost scared to try it out. If I eat it, my brain might explode. Your photos are, as usual, most inspiring….thanks! BTW, I loved this post, S’s & CH’s narrative blending together, lovely cake story, chocolate, great picture…nice! WOW….looks and sounds awesome! I dont know if i will have the necessary skills to make this cake though….after my initial frustrating Chocolate Molten cake experience last weekend! Not very skilled in baking but i should make a note to try it. Btw, being so new to blogging and HTML, mind if i ask how you inserted your “Chubby Hubby” picture banner at the top of your main page? I love how you incorporated that into your header. Hope you could advise me how. Thanks! i was in vienna last summer but was busy doing the heuringer round instead and missed out on sachertorte… this is my chance to try to bake my own! Hi Slurp, We have a convection oven, but when I bake, I only use the fan when I’m pre-heating. I placed this particular genoise on the centre shelf and only baked it using the top and bottom heating elements. If you have an oven that doesn’t give you the option of turning the fan off, then you need to reduce the temperature that you’re baking at and bake the cake for a shorter period of time. But I find that the most important thing is to have an oven thermometer. You’ll be surprised by how dramatically the temperature in the oven varies from the setting on your oven dial. Skrat: Don’t get disheartened, baking just takes a little practice. I used to be terrified of it. But I now make those molten chocolate cakes a la minute (by the time I get towards the end of a dinner party, I’m usually a little tipsy, but I still get by). Keep at it. Which recipe did you use? Pille: I love milk curd strudel. It’s a good book to have but I can’t say for sure if all the recipes work well. Mel: Very glad to see another Sachertorte fan out there. Oh, my course was in German language. 🙂 But a 1 month Viennese pastry course would have been fun. anonymous: Thanks. Funny comparison with the models. Of course, 1) beauty is in the eye of the beholder (ooh, I sound like a fortune cookie) and 2)some really pretty things have loads of substance…like Pierre Herme’s creations for example. Skrat: I made the banner image in Photoshop and then deleted the code that blogger uses for headers and replaced it with an image link. Lil: Yum… Austrian wine taverns. I spent too many nights stumbling home drunk from these over the subsequent 3 months, when I was living in a small town in Burgenland. Hi S, thanks for the encouragement, i do hope to get better at baking as i do occasionally enjoy a sinful chocolate dessert! 🙂 I found the recipe on Epicurious, compared many other molten cake recipes and decided on this one. The recipe name is “Chocolate Molten Cakes”. I cant seem to paste the entire link in here for you, but i have posted it on my blog if you dont mind checking out. Recipe said to bake for 15min at 200 deg C but in my oven, it only took 9min. The initial recipe i used from Delia’s How to Cook Book Two didnt work for me. Im guessing its the proportion of butter & choco or maybe its my oven, i am using the Baby Belling and its known to be a really hot oven, purely element, no fan. I read your reply to Slurp about an oven thermometer, can i find it at any bake shop and fix it in my oven? Hey CH, thanks for the tip. I will give it a shot after i get hold of my photoshop programme. Hi Skrat, can you please email me at ChubbyHubby’s email (you’ll find it under the little note about being an Straits Times Hotblog)? I’ll send you the recipe I use. The biggest difference between the Epicurious one you used and mine is that my recipe has a nearly 1:1 ratio of chocolate to butter (by no means a weightwatcher’s treat). And I cook mine for around 6 minutes at 225 degrees Celsius. You can get oven thermometers at Phoon Huat. I eventually bought one from WMF because the dial is much easier to read through the oven window (but it’ll probably make no difference with your windowless Baby Belling). Beware that oven thermometers break down rather quickly too. Oh, I’m so glad you posted the recipe. I can’t wait to try it. I’m definitely in agreement with you about Hotel Sacher’s being better – I found it just that little bit more moist than Demel’s. Great photo and great writing to match! Such a pleasure reading your blog. What a wonderfully informative post. And that Sacher Torte looks and sounds absolutely divine! Indeed, your oven sounds most charmingly quirky…clearly designed by one of those tech geeks who don’t bake much. Definitely try using an oven thermometer. It can be quite a revelation. Hi, I love your blog and have been reading it for years with many successful attempts at the recipes. However for the chocolate cake, it turned out flat. When u say cake flour, it means superfine or top flour rite? Not self raising? Or is there a raising agent thats missed out in the recipe? I made a Sacher Torte last night and wanted to thank you for the tips and recipes on this post. I’d already had the cake in the oven when I decided to do some research on this torte. Anyhow, I wasn’t able to use S’s cake recipe suggestion but I did get to make the divine ganache to top it off with. My torte came out surprisingly yummy. Thank’s y’all! It looks amazing! I am so doing this soon… yum!!! Dear Anne, I hope the recipe works out well 🙂 Even now, the genoise is something I rarely attempt because it calls for such a light hand.